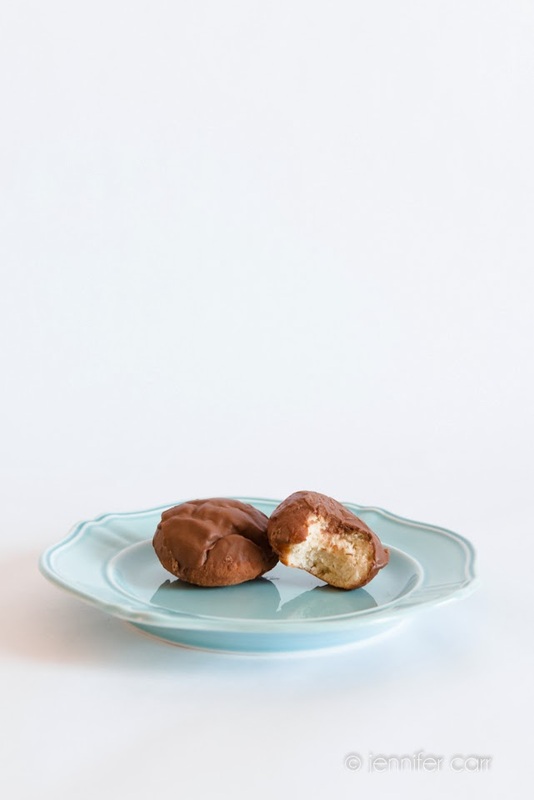 Peppermint Patties have always been a favorite treat in my house. We used to keep bags of bite sized York Peppermint Patties in the pantry to always have an after lunch treat. Once we went natural, the originals were replaced by Trader Joe’s Dark Chocolate Mint Creams. Now, the poor TJ’s version has been replaced by these homemade treats. 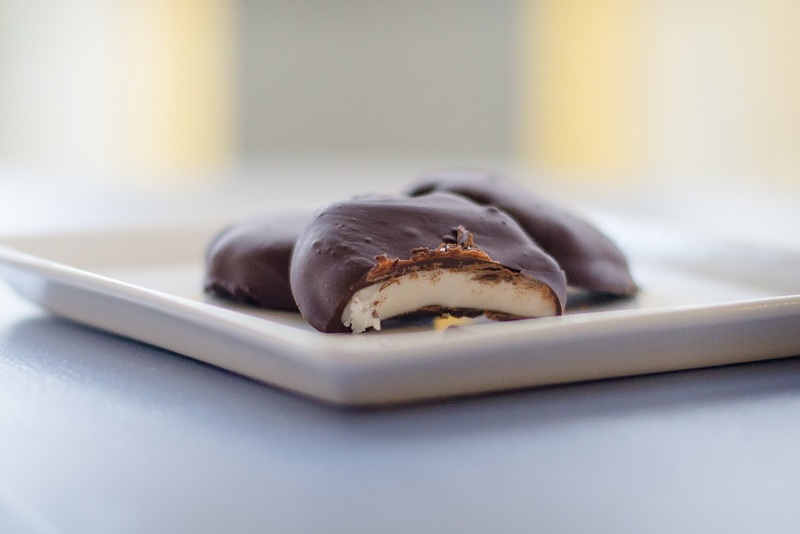 Homemade Peppermint Patties are easier than you’d think. The downside is, they don’t last very long! I imagine I’ll have to make a batch a week to keep up with demand. Combine powered sugar, water, coconut oil, corn syrup, and peppermint oil in the bowl of a stand mixer and mix until it comes together. Dampen your hands and form mixture into a ball. Place on parchment paper and flatten into desired thickness. Add powdered sugar as necessary to keep from sticking. Use a small cookie cutter to cut into desired shapes. Place shapes onto a parchment lined cookie sheet. Put finished shapes in freezer for 30 minutes. Meanwhile, melt chocolate and coconut oil, stirring until smooth. Coat peppermint shapes with chocolate mixture, working quickly to avoid too much softening. I don’t worry about the messy extra chocolate, it’s just bonus chocolate! Allow candies to set in refrigerator on a parchment lined cookie sheet. Store in refrigerator. I can come up with just about any excuse to make fresh whipped cream. In the winter, it’s hot cocoa, almost nightly. This spring, it’s fresh picked strawberries for the (only!) local organic field. Get yourself a handy dandy whipped cream maker, it’s a quick and easy process which is worth it! 1. Combine ingredients & “whip” according to manufacturer’s instructions. While you can simply top your ice cream with this delicious goodness, for an even tastier treat, add it to your basic Vanilla Ice Cream recipe. 5. Transfer the spread to an airtight container, and store in the refrigerator for1-2 months. For best results, stir the chocolate-hazelnut spread before using. I had all the ingredients for s’mores except marshmallows, so I pulled out an old recipe that I had tucked in a binder. I have no idea where it originated, but I’m sure glad it did! In the bowl of a stand mixer fitted with the whisk attachment, whisk egg whites, corn syrup and salt, about 5 minutes until thick and fluffy. Slowly add in sugar beating on low speed until well blended. Add vanilla and mix until blended. This recipe may be frozen for later use. Remove from freezer and stir until fluff is mixed. It can be kept in the refrigerated for up to 1 week. Stir well with a spoon before serving. You can use this in any recipe that calls for marshmallow creme/fluff.